Produktinformationen "2015/16 Panini Limited Basketball Hobby Box NBA"
All autographs will be live! No Redemptions or Panini Points! Limited returns after a three-year absence and is true to its name - a short case run full of both unique and classic content! Find Rookie Jersey Autographs from at least 35 of the NBA's top prospects, sequentially numbered to 99 or less! Look for Dual and Trio Signature cards, featuring some of the league's top rookies, stars and legends! All-Star Game-worn material returns with oversized shorts swatches worn during the 2015 NBA All-Star Game! Pull rare Phenoms and Rookie Phenoms, falling one per case on average! 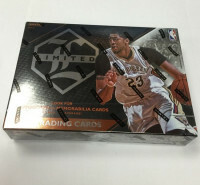 Limited is loaded with low-numbered content, including Prime versions of Rookie Jersey Autographs. Look for oversized patch autographs from at least 35 top prospects! Limited is packed with unique autograph content! Look for inserts that feature single, dual and triple signatures all sequentially numbered to 99 or less! TEAM TRADEMARKS PRIME: Score jumbo content in Team Trademarks featuring unique die-cuts of the player's team name or nickname! ALL-STAR SHORTS PRIME TAG: For the first time ever, find laundry tags from stars of the 2015 NBA All-Star Game! These stunners created from game-worn shorts are numbered One of One! MATERIAL MONIKERS PRIME: Find multi-colored jumbo content in Material Monikers featuring unique die-cuts of the player's team name or nickname! 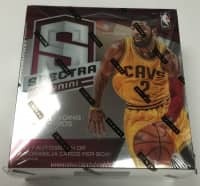 Weiterführende Links zu "2015/16 Panini Limited Basketball Hobby Box NBA"
Fanbewertungen für "2015/16 Panini Limited Basketball Hobby Box NBA"